Hi guys!!!! Today I wanted to share with you one of my favorite beauty items. 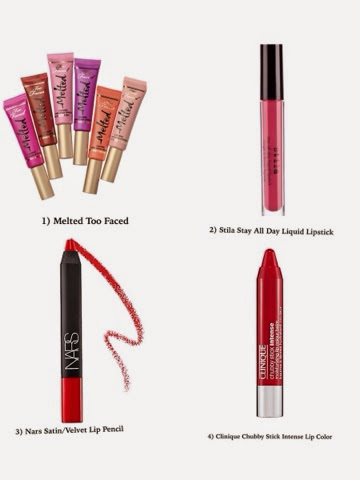 I am currently obsessed with these lip crayons and stains in reds and pinks. I've gotten so many compliments on wearing bright red or pink lip color. My friends keep telling me "I love it on you but I could never wear that color". My response is always "Yes you can". If you want to try this look, I recommend wearing lighter eye makeup like some basic shadow and mascara and adding one of these amazing colors to make your lips pop. 1) Melted by Too Faced-- Sephora--- I love this lip stain. It has a little sponge on the tip and as you press it on your lip, color comes out. I love fuscia. It's my absolute favorite. 2) Stila Stay all Day Liquid Lipstick-- Ulta-- This is such an amazing product. It goes on like a lipgloss but then dries almost immediately. My favorite color is Beso. It stays on really well. 3) Nars Satin/Velvet Lip Pencil-- Nordstrom-- This is a great crayon. It goes on so easily . My favorite color is Dragon Girl. It's a great shade of red and gives a matte lip look. 4) Clinique Chubby Stick-- Nordstrom--- What I love about this pencil is that it goes on like a crayon but it stays shiny and really moisturizers as it colors your lips. I love Mightiest Maraschino. So ladies remember I always try to encourage you to step outside of your comfort zone when it comes to fashion and the same goes for makeup. Try a bright red or pink lip. Let me know what you think. And don't forget to follow me on Instagram ( @everythingevelyne), Facebook, Bloglovin and Luvocracy (Evelyne Marks). Happy reading!!!!! Hi guys!!!!! 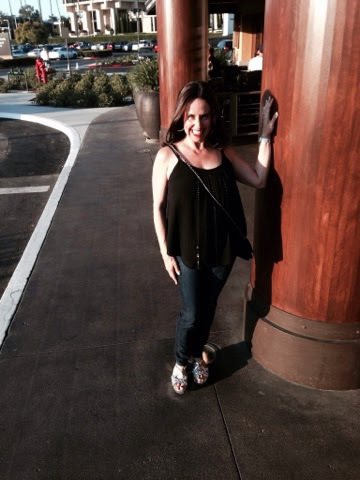 I just went on a date night with my husband Jeff to his favorite restaurant Flemings in Newport Beach. 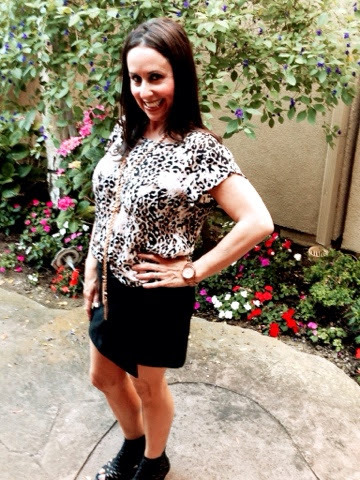 The weather has been so beautiful in Newport so I thought the perfect outfit would be a black tank top with my favorite skinnies and silver Miu Miu shoes. 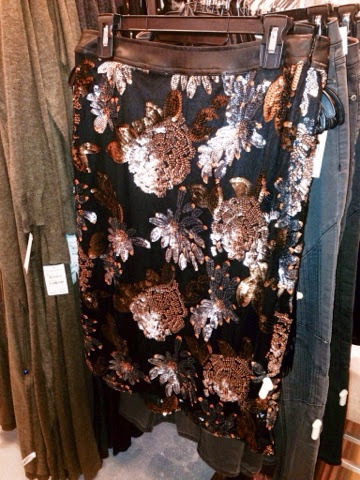 I love this black tank top with sparkles of silver down the front. The touch of silver dresses up this basic style. I also love how flowy and flattering it is over my favorite pair of Joe's skinnies. 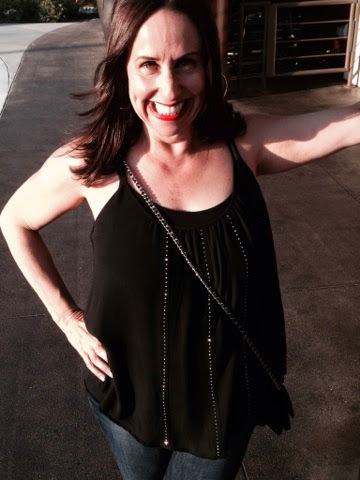 I purchased this tank top at my friend Sheri Thomas' store called Blush (in Encino and Calabasas). You have to check out this store if you are ever in the San Fernando Valley. She carries amazing pieces for great prices. 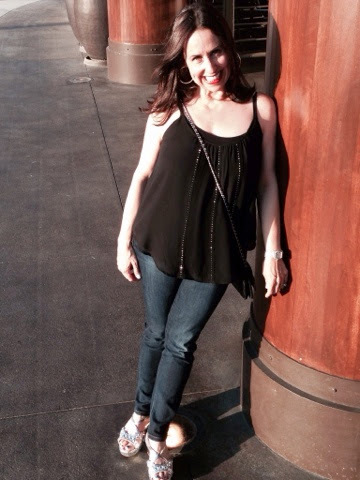 I paired my black tank and jeans with one of my favorite pairs of shoes by Miu Miu. I recommend adding to your wardrobe a great pair of shoes that has a unique texture or bright color. Fun shoes add pizazz to any outfit. So try adding some silver and sparkles to any basic black outfit. And have fun with it. Thanks to Cathy Cordas for photo editing. And remember to follow me on Instagram (@everythingevelyne), Facebook and Bloglovin. Happy reading and let me know what you think by adding comments. Hi guys!!!! My friends know that when I like something I love sharing it with everyone. I recently discovered a new fun product called the Sand Cloud. It's a beach towel that has a built-in pillow. 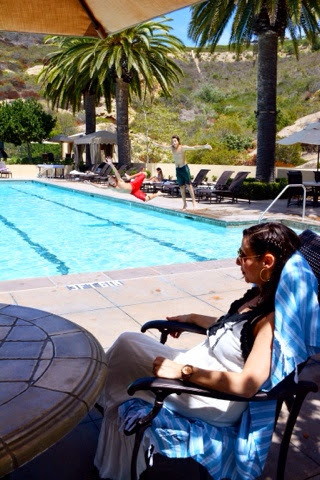 When I am watching my kids at the pool or beach (as I did the other day with my friend Cathy), I can sit up and watch the kids easier. It is much more comfortable than a traditional beach towel. I also love that it's made from 100% Turkish cotton and is machine washable. 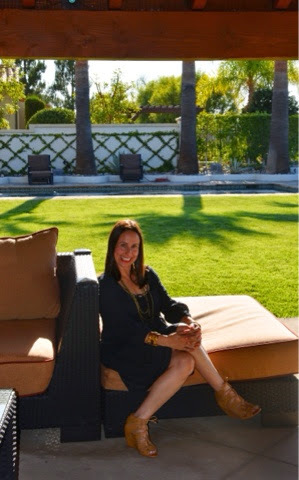 The blue and white cabana style stripes goes great with many of my pool/beach outfits. I plan to use the Sand Cloud at the pool, beach and park all summer. Sand Cloud donates 10% of their net profits to several foundations that support marine life. So buy a Sand Cloud and support the environment. Happy Reading and let me know what you think! Thanks to Cathy Cordas for photos and editing. 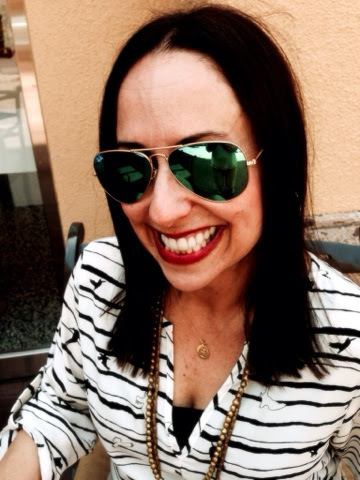 Don't forget to follow me on Instagram (@everythingevelyne), Facebook, Bloglovin and Luvocracy (Evelyne Marks). This post is sponsored by eShakti.com. Everything Evelyne was compensated through a sample to review, but all opinions are my own and Everything Evelyne does not receive commissions on purchases. Hi guys!!!! I was approached by eShakti a few weeks ago to review one of their products and was so excited to see what they were all about . EShakti is an online site (eShakti) that provides real fashion for real people. 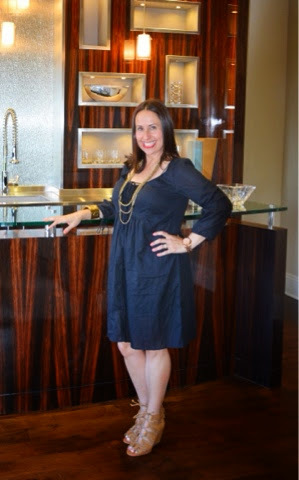 They offer standard sizes (0 to 36), but also specialize in custom clothing made to the client's measurements. EShakti believes that all women should wear affordable fashion that is created for them to make them look their very best. I was shown many different styles to choose from. 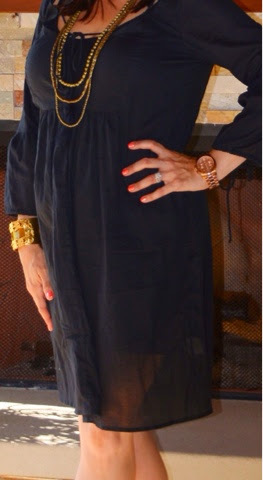 I chose this basic black lace up cotton dress. I love the bohemian style and lace up details around the neck and arms. The fit is very flattering. Because the dress is not lined, I wore a long black tank slip by Daftbird underneath. 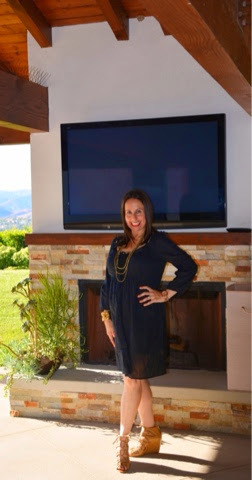 I paired it with my favorite African beaded necklaces and my camel Dolce Vita wedges. It was the perfect summer outfit. Although eShakti offers their custom service, this standard size small (4-6) fit me perfectly. What I really like about eShakti is that all women can wear it and embrace this bohemian trend, as well as other trends in their collection. I suggest you check out their website (eShakti ) and find the perfect piece for you. EShakti is offering 10% off to all Everything Evelyne readers by using the code 'eeves' from now until August 3, 2014. I hope you check it out. Thanks to Cathy Cordas for photos and editing. Happy reading!!!! Hi guys! I love date nights in the summertime. 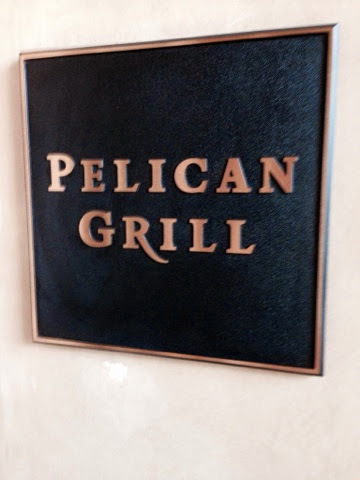 My husband and I went to one of our favorite local restaurants called Pelican Grill in Newport Coast with another couple friend. We had such a nice time. 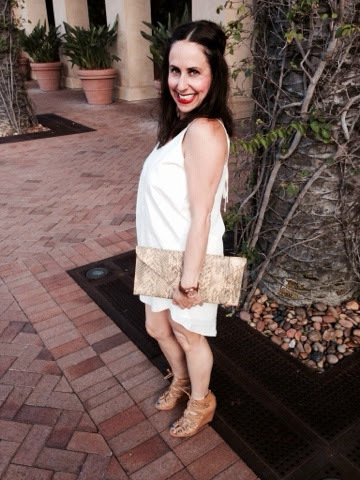 I wore this fun, hip faux leather cream dress by Olivaceous. I love the flowy cut of this dress. 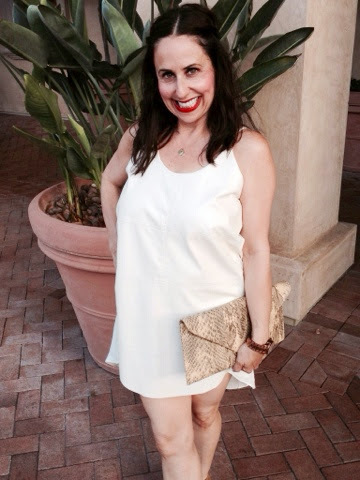 Every girl needs a great summer cream dress. It's the perfect alternative to traditional black. 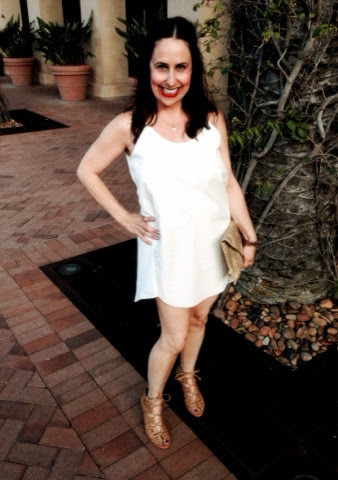 I paired this cream dress with camel colored Dolce Vita lace up wedges. Mixing up cream and camel is a great color combination. You can also wear this trend by pairing a cream top, skinny jeans and camel colored wedges, sandals or booties. I added a great clutch and my look was complete. I recommend investing in a clutch style purse. It's perfect for an evening out. 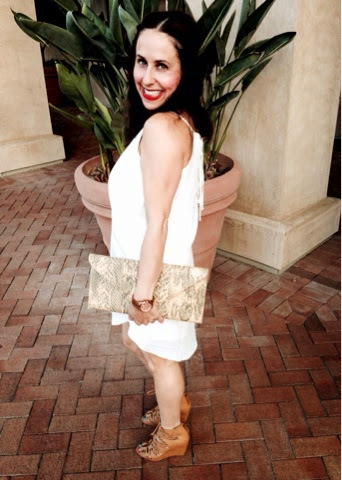 Try incorporating cream and camel into your summer wardrobe for a new look. Let me know what you think. Thanks Cathy Cordas for photo editing. Don't forget to follow me on Instagram ( @everythingevelyne), Facebook, Bloglovin, and Luvocracy (Evelyne Marks-- you can order all the items I list in all posts through Luvocracy). Happy reading!!!! Hi guys!!!! I just have to share with you my excitement for the Nordstrom Anniversary Sale. This is my favorite sale of the year. 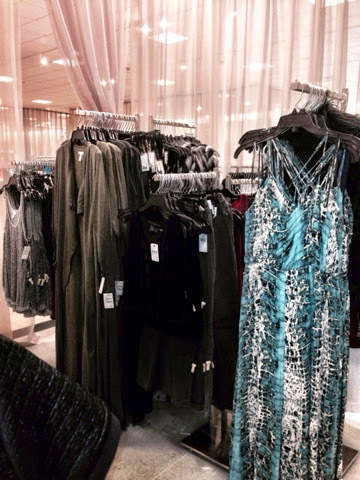 I love the Nordstrom at Fashion Island in Newport Beach, especially for their wonderful staff. 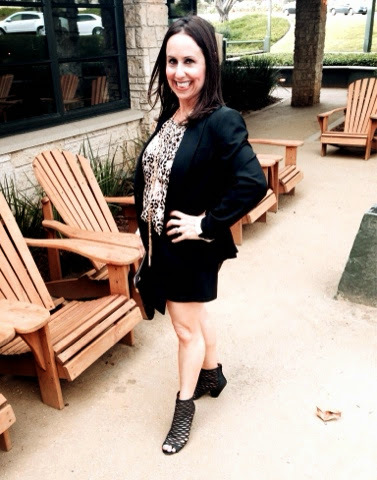 Danielle is the manager of Savvy, one of my favorite departments and she always dresses so stylish and chic. Ashleigh has been such a help to me whenever I need that special something. She is so good at styling outfits and helping me add a few new pieces to my existing wardrobe. This sale is my favorite because it is the introduction to all of the new fall pieces. 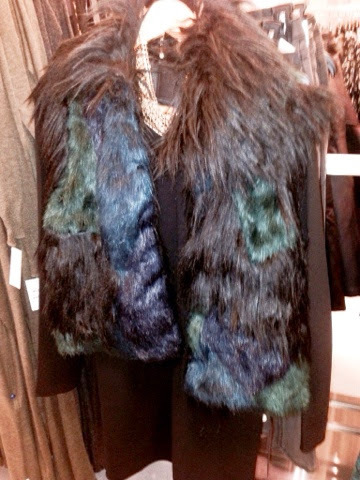 I especially love the Savvy department because they carry such reasonably priced items that are so fun and trendy. This year you can find some of Ashleigh' s recommended items like 1) A Topshop faux fur vest (I'm obsessed with the blue and green color and how she styled it over a basic black dress and a fun gold necklace), 2) a great brown and black faux leather jacket by Blank NYC (Blank NYC comes out with a different version of this perfectly fitting jacket every season), 3) an embellished skirt by Joa (embellished shirts and skirts are a huge trend for fall and I especially love this below the knee length), and 4) a faux feather style skirt by Leith (I love this detail and it is such a statement piece for fall paired with a blazer and booties). There are many more options to choose from but these were some of our favorites.These pieces are essential to any girls fall wardrobe. 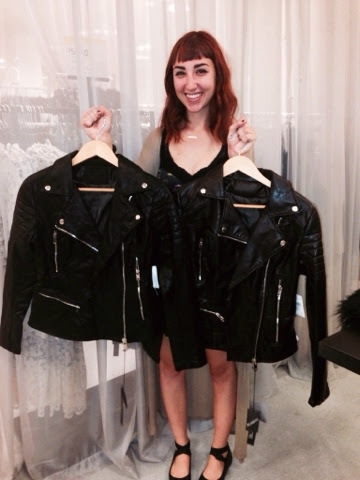 So remember, if your are near Newport Beach come see Ashleigh and Danielle at the Fashion Island Nordstrom. 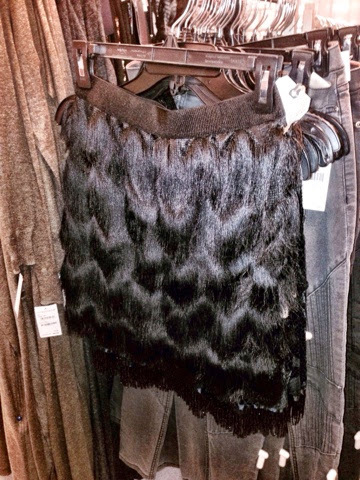 But you can also visit any Nordstrom to find these classic and hip pieces. Let me know what you picked up at the sale. Thanks to Ashleigh and Danielle and to Cathy Cordas for photo editing. And don't forget to follow me on Instagram (@everythingevelyne) and Facebook. Happy reading!!! Hi guys!!!! 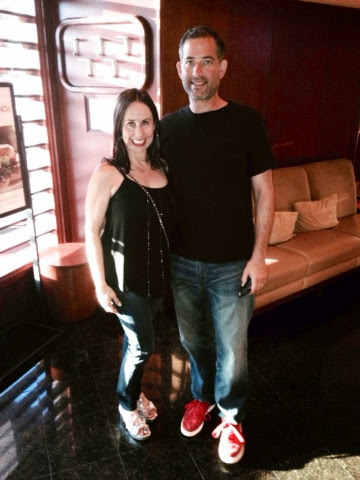 Today I wanted to talk about how important your shoes and sunglasses are to your summer outfits. I love the simplicity of this cute shirt dress. But what really makes the outfit complete is adding an amazing pair of gladiator sandals and great, fun sunglasses. Gladiator sandals are current and trendy. They look great with a shorter dress, denim skirt or shorts. They dress up bare legs and create a whole different look. I have them in black and gold and have been wearing them all spring and summer. A new pair of sunglasses can change the look of an outfit. I love these green tinted Ray Bans. They are really unique and I get many compliments on them. 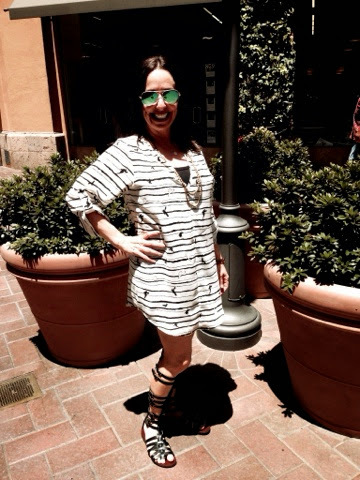 So remember -- adding a fun new summer trend like a gladiator sandal or fun sunglasses can complete any outfit. Try adding these to your current summer wardrobe and let me know what you think. Photo editing to Cathy Cordas. And don't forget to follow me on Instagram (@everythingevelyne) and Facebook. Happy Reading!!!!! 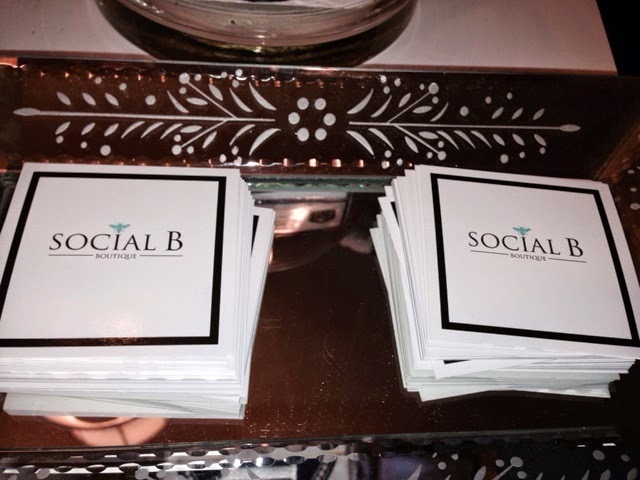 All items can be found at Social B in Newport Beach. 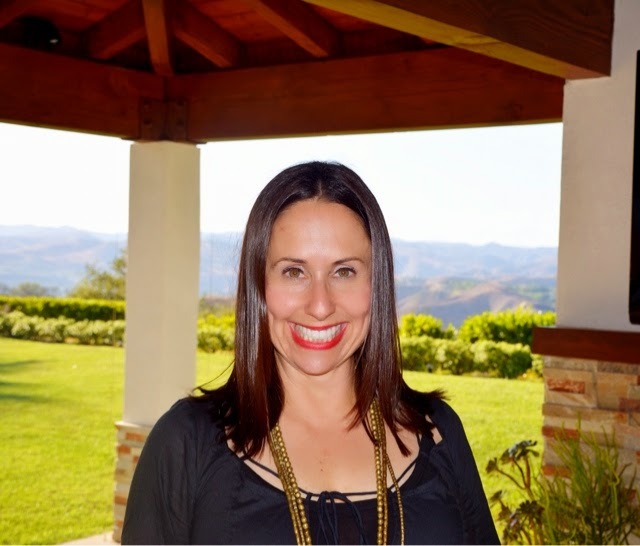 You can call Christy at 949-533-3525. It's located at 359 Old Newport Blvd, Newport Beach, CA 92663. And follow on Instagram (@socialboutique). Hi guys!!!! Happy Fourth of July. For my family, it is a time to hang out at the beach with friends and watch fireworks. For others, it is a time to go on vacation. I wanted to write a post about a one stop shopping place you can visit to get all of your vacation essentials. 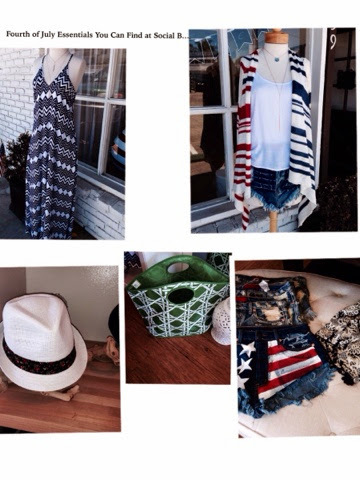 Social B is owned by my friend Christy Salem and carries amazing clothing and great vacation items. 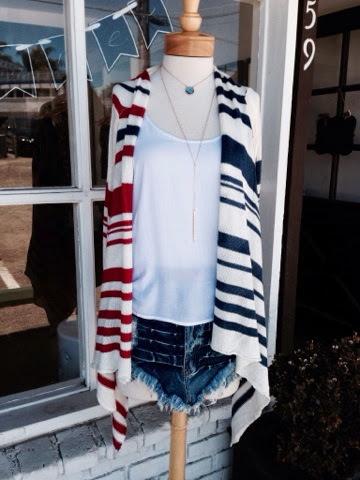 1) The cardigan style sweater-- I love this red white and blue version that is perfect for cooler nights on the beach or at the pool. 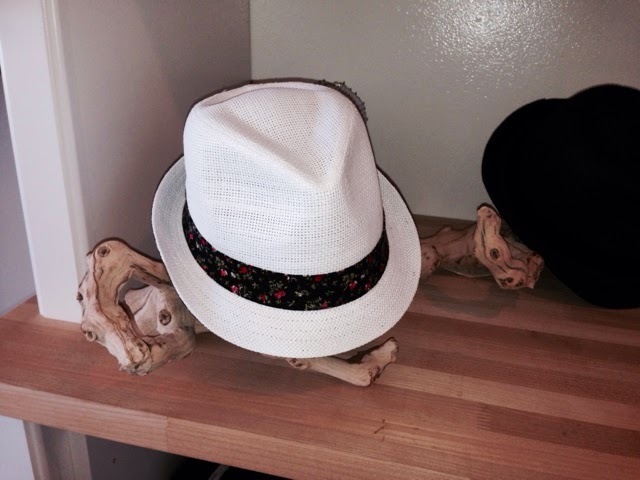 2) The fedora hat-- I think this style hat is flattering on everyone. 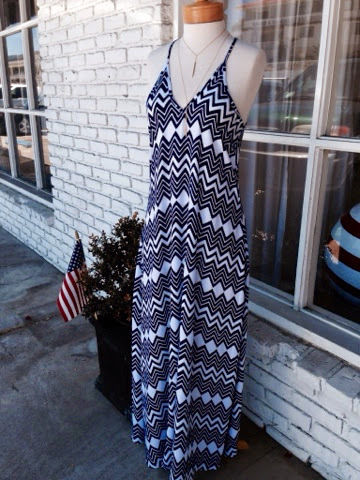 3) The maxi dress-- I love this blue and white one. It can be worn from day to night by just adding a denim jacket. 4) Basic shorts-- I love great denim or flowy shorts. You can pair them with a cute t shirt or even over a bathing suit. 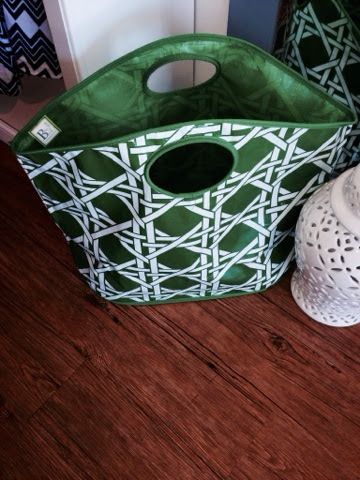 5) A big beach bag-- I love this color and shape. Enjoy whatever vacation you are having this weekend. 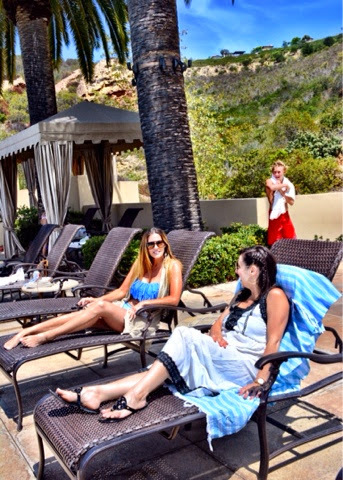 Let me know about your favorite vacation essentials and check out Social B. It is such a cute store. Don't forget to follow me on Instagram (@everythingevelyne) and Facebook. Happy reading!!!! Hi guys!!!!! Ok I know what you are thinking, the skort, is it really back? And the answer is yes. I have been seeing skorts everywhere. It is the combination of a skirt and shorts. I just love this faux leather one by Topshop at Nordstrom. When I embrace a new trend, I like to buy it in the most basic form. 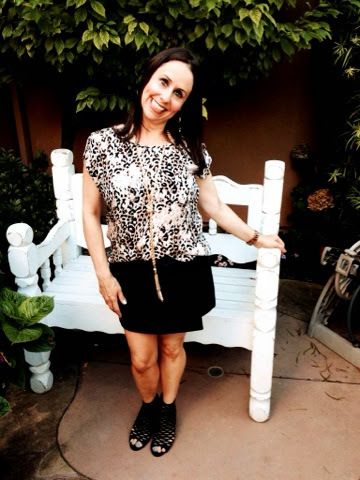 Even though I have been seeing many different patterns and fabrics of skorts, I felt most comfortable in this solid black version. I paired it with one of my favorite Joie tops (that comes in so many different styles and prints) and partially tucked in the front. With certain pants and skirts, this partial tuck of your top or blouse really gives the outfit some shape and definition. 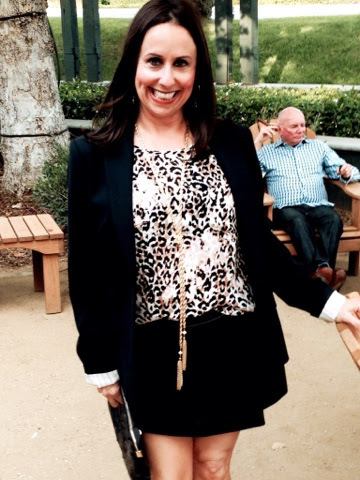 I also added some of my favorite open toed booties and a great Baublebar tie necklace and, voila, this funky look is complete. I hope that you try to embrace this new skort trend in any way that is comfortable for you. Let me know what you think and keep me posted on if you like using this partial tuck trick. Thanks to Cathy Cordas for photos and editing. Don't forget to follow me on Instagram (@everythingevelyne) and Facebook. Happy reading!!! !